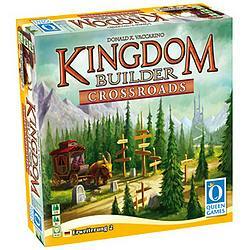 Kingdom Builder: Crossroads introduces new game components and tasks into the successful game: four new landscapes, each with two different location spaces, provide new options for shaping the kingdom. Use warriors to prohibit your opponents from building settlements in key places or to claim new areas, expand your kingdom with wagons and ships. The new task cards challenge the players to build fortresses, roads and places of refuge and reward them with gold, should they be up to the task.